Always plan a move carefully. That is rule number one. It doesn’t matter if you’re moving an odd item or your entire household it is in every case good to have a picture in your head how the moving would unravel. And although the thought of doing it yourself is often very tempting we’d recommend you consider using the specialized man and van services we offer. It is very easy to underestimate the logistics of switching from one Liverpool office to another or moving to a new house. Most people have difficulty grasping the amount of items they posses and the potential hardships their transportation could hold. 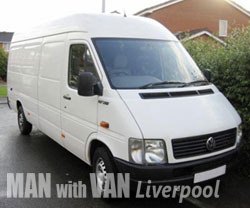 Book man with van services in Liverpool and save yourself a pile of troubles. Man With Van Liverpool‘s team of movers is there for you. We’re prepared to move your items anywhere in the vicinity of Liverpool at a day and time convenient for you. Apart from setting time and date you can also choose the amount of vans you hire depending on your needs. If you happen to have underestimated the amount of load that need to be moved – no problem. You can always request another van on the sport. Or if you need so – you can always ask to use our services longer than the time of the initial request. We’re there for you for the entire duration of transportation. If you’ve having difficulties in packing your items our professionals are ready to help you out – botch with packaging materials and the process of packaging itself. You can trust them to pack, load and arrange the cargo in the van in the safest way possible. Not only that but their experience ensures they transport the goods as fast as possible so don’t worry – your furniture will not be stuck in traffic at some busy Liverpool junction. “Communication with the customer” is our motto. This is why we’ve assembled on of the best support teams in this industry. You can reach out to us via phone or email everyday (weekends included) from 00:00 to 24:00. The support guys and girls will always be ready to offer you a personalized plan for hiring Liverpool van and a man. Our goal is to be as flexible as possible when it comes to offering you a “hire a van” service plan. The team will be there for you no matter why you turn to them – be it to get a consultation, ask to use our rent-a-van offers or in the highly unlikely event of issues with our services. Call us or send as an email and our team will help you choose your personalized plan today.